In 1942 Ben Hogan was one of the top players on the PGA Tour competing against other future Hall of Fame members such as Sam Snead, Jimmy Demaret and Byron Nelson and though he was one of the best players he had not yet won a major championship nor attained the almost mythic status he has today. Since the attack on Pearl Harbor in December 1941, sports had taken a backseat and the United State Golf Association cancelled the US Open until the end of the war. However in 1942 what at least seemed to be a US Open was staged the third week in June by the USGA, the PGA of America and the Chicago District Golf Association at Ridgemoor Country Club not too far from the present location of O’Hare Airport. The tournament was for the benefit of the USO and Navy Relief Society and was run like a national championship with 69 local qualifying locations and 14 regional qualifiers around the country for the more than 1,500 golfers who entered…just like an Open. Sales at the gate were brisk, more than $15,000, and as usual USGA rules were followed overseen by USGA officials. Members of the military in uniform were allowed in without paying for a ticket and there’s interesting side note about the event’s name. 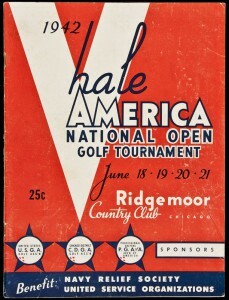 Called the Hale America National Open, the tournament (or championship depending on your opinion) was meant to promote a national health program being pushed by three-time Olympic rowing medalist John Kelly, father of actress Grace Kelly. In winning Hogan received $1,200 in war bonds and a medal similar to a U.S. Open medal with the inscription “Tournament” not “Championship.” But unlike an Open, the field included senior golfers playing in a separate division and Ridgemoor’s rough was nowhere near as tough as the usual “Open-rough” which certainly was a factor in the scores being the lowest ever for an Open. Also there was no cut after 36-holes and to attract spectators an exhibition featuring entertainer Bob Hope plus a long drive contest were put on the day before. So it can be argued the Hale America Open didn’t necessarily fit what is thought of as a National Open. Hogan played like it was a major though, opening with a 72 following on Saturday with an outstanding 62 and finishing on Sunday with rounds of 69 and 68 to beat Jimmy Demaret by three. An impressive performance by any standard and if this were to be counted in Hogan’s major victory total and added to his US Open wins in 1948, 1950, 1951 and 1953 it moves him to just one less major than Walter Hagen. So is this year’s championship in Pinehurst the 114th or 115th? 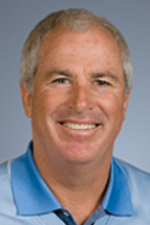 Does Hogan really have five not four US Opens? Ten majors not nine? Until his death Hogan thought he did.